Changes are afoot in the local life insurance industry following the launch of Bank Negara Malaysia's Life Insurance and Family Takaful Framework in November 2015. Several initiatives aimed at benefiting consumers have already been implemented and more measures will be rolled out in stages over the next few years. As industry players adapt to changes in the landscape, consumers will be the beneficiaries of these initiatives, says Rohit Chandrasekharan Nambiar, the 39-year-old CEO of AXA Affin Life Insurance Bhd. "Many consumers are not aware of the announcement and implementation of the framework because these things are happening at the back-end. But they will feel it in the months and years to come," he adds. One initiative that is already in place is the balanced scorecard for intermediaries, that is, insurance agents. The scorecard, officially implemented last year, comes under the framework's key pillar of strengthening various market practices to elevate the level of professionalism in the life insurance and family takaful industry. Simply put, the scorecard sets out a basic structure for insurance companies to remunerate their agents so as to achieve outcomes that would benefit consumers. There are several key performance indicators, including sales target (30%), customer fact find (15%), persistency ratio (30%), number of substantiated complaints (10%) and 30 hours of a continuing professional development programme (15%). Previously, there were no standardised targets and some of these components were determined by the intermediaries themselves. The sales target requires agents to sell 12 insurance policies a year or achieve RM50,000 worth of annualised first-year premiums. Customer fact find encourages agents to provide clients with advice based on the latter's financial needs and circumstances. The persistency ratio incentivises agents to ensure that the policyholders continuously pay their premiums in the first and second years. Aaron Gajaindaren, founder and group agency manager of GE Lifesavers Sdn Bhd, says the scorecard is akin to how floating rate loans are determined, where the bank's loan rate is added to the base rate set by the regulator. "You multiply it with another set of internal weightage determined by the insurance company and you get the final result. The final score can go beyond 100%." Chris Eng, chief strategy officer at Etiqa, the insurance and takaful arm of Malayan Banking Bhd (Maybank), says the scorecard is aimed at getting agents to pay more attention to their clients' needs and be less sales-driven. "This takes on a more holistic view compared with the previous approach." Lucas Ooi, co-founder of Jirnexu, the parent company of financial comparison platform RinggitPlus, agrees. Previously, many agents would push products just to hit their sales targets, without understanding their customers' needs, he points out. "Sometimes, it may be due to the ignorance of the consumers. But sometimes, it is because the agents were told to push certain products to get more commissions. As a result, their customers could have so much life insurance coverage, for example, but have insufficient medical coverage. "Also, because it is harder to get people to put their money in a life insurance policy compared with, say, an investment product [which could potentially generate high returns], they could sell products with higher saving elements to get more commissions. The scorecard can help improve such situations." While AXA has zero tolerance for misselling, Rohit says such practices could be done unintentionally due to the lack of knowledge or explanation of some part-time agents. "There are professional agents and there are those who are still figuring out their careers. In general, about 50% [it is higher in some companies, but lower in others] of those in the industry belong to the second group. These people usually leave the industry when they feel things are not right for them. Some will pursue other careers." What the framework has done is encourage part-time agents to become full-time professionals. Those who do not will find it difficult to survive in the industry, he says. "We will eventually see fewer part-timers." Eng and Ooi say the initiative has already weeded out a number of part-timers. Another key pillar of the framework is the requirement for insurers to offer standalone, commission-free, pure protection products, such as term, critical illness, medical and health insurance/takaful, on at least one direct channel. This can be sold offline at their head office and branches or online via their websites. Both former Bank Negara governor Tan Sri Muhammad Ibrahim and current governor Datuk Nor Shamsiah Mohd Yunus have called for insurance products to be distributed online. In October 2017, the former central bank governor mentioned that online insurance distribution accounted for less than 0.1% of the industry business volume, which was a "very poor achievement". In September last year, Nor Shamsiah said the regulator would like to see more impact coming from the direct distribution channels, including online and mobile platforms. Before the framework was launched, consumers were unable to buy life insurance products online. Today, they can buy term life, medical and critical illness products through the websites of insurance companies and the online platforms of third-party financial technology (fintech) players. Younger consumers are poised to benefit from this as insurance companies such as AXA are trying to carve out a niche in the online market. Despite being one of the world's largest insurers, the company has only been operating in Malaysia for 13 years and does not have a large agency force, says Rohit. He points out that the traditional agency distribution channel is dominated by the top three players and is hard to penetrate. According to industry observers, these companies are AIA Bhd, Great Eastern Life Assurance (M) Bhd and Prudential Assurance Malaysia Bhd. "That is why we want to position ourselves differently and create a young millennial brand," says Rohit. He adds that the insurance penetration rate is low among this segment, which includes young married professionals and those who have just started working. "There are about 10 million of them. So, it is a massive opportunity overlooked by some." Over the years, AXA has been conducting focus groups with millennials and the feedback it has consistently received is that insurance policies are too expensive, too complex and too lengthy. "These are the pain points that we want to focus on and solve," says Rohit. In April last year, AXA launched its eMedic product, which costs as low as RM37 a month for an annual limit of up to RM100,000. The product can be bought by answering three simple questions before making an online payment. "This compares with more than 20 questions if you were to buy a term life product online from some of the digital players," says Rohit. According to AXA's website, a 31-year-old who does not smoke can buy a one-year term life policy, with a sum insured of RM100,000, for RM21.83 per month. The process for this product is slightly longer than the one for eMedic as the customer needs to provide personal information on top of answering the three questions. The whole process, however, is still relatively fast. 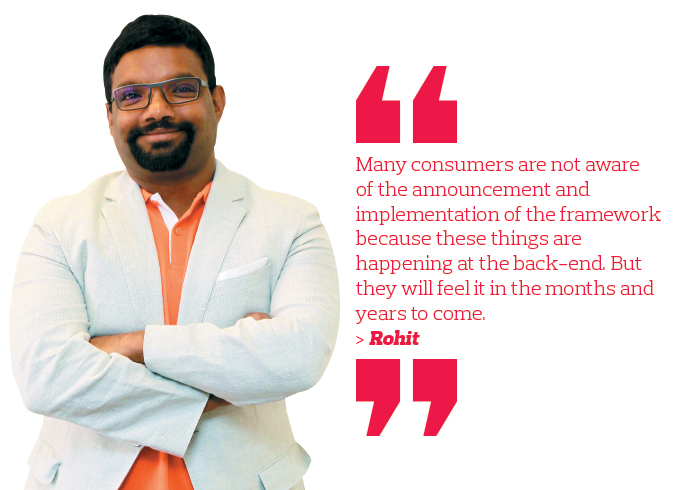 "We have a very e-commerce mindset and I want that to be built into our products," says Rohit. 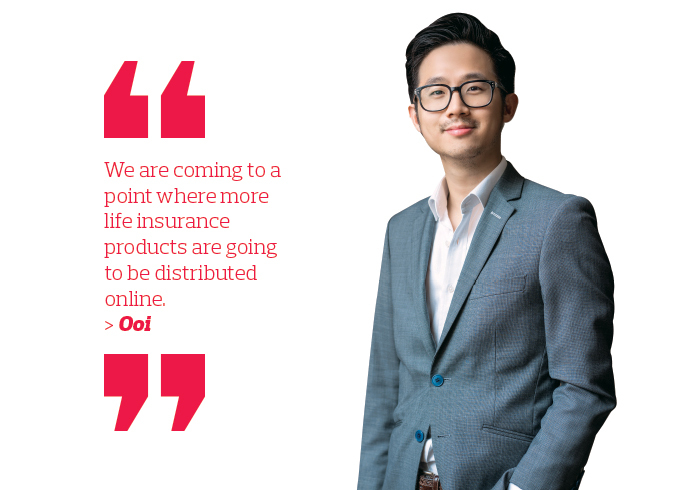 By enabling the distribution of simple life insurance products online, fintech and insurance technology (insurtech) start-ups are given the opportunity to thrive as they can offer a more comprehensive range of products on their platforms, says RinggitPlus' Ooi. These insurtech players include Fi Life (previously known as U for Life), said to be the largest online provider of term life insurance in Malaysia; Policy Street, a platform that allows consumers to compare and purchase insurance products online; and Fat Berry, an online insurance marketplace that was established in February last year. Financial comparison platforms such as RinggitPlus, iMoney and GoBear have also benefited from the initiatives. "We are coming to a point where more life insurance products are going to be distributed online. But these are the more simple and straightforward ones. Some insurers with a smaller agency force, such as AXA, is working with us to distribute their products," says Ooi. On the growth of life insurance products sold online, Etiqa's Eng says it could be bigger than some industry players expect. "Yes, some have said insurers should be happy when the sales of online products take up only 1% of the total market. That may have been true three years ago, but it is not so true now and will definitely not be true in the future. "More people have found it intrusive to have people come and sell products to you. They want to make their own choices at their own pace and freedom. But of course, life insurance is a complex product and there are more things to consider. But as the more simple ones come out, you can see these being picked up." He adds that Etiqa would be the biggest online insurer locally if one looked at the gross premiums of the general and life insurance products sold online. "Those being sold online are mainly general insurance products. But we are trying to push some life products too." Not all initiatives of the framework have been received well, though. On Nov 9 last year, 4,000 insurance agents turned up at Prudential Tower in Kuala Lumpur to air their views on the balanced scorecard. According to a report in The Star, the event was organised by Prudential Life Insurance Agency Association as a last resort after a year of fruitless meetings. Maniraja Chandran, president of the association, was quoted as saying that the members were dissatisfied with the increase in sales target and cut in bonuses. "Our commissions or bonuses have not been increased for decades. So, cutting the basic commission, as well as increasing the target for bonuses, is totally unfair." GE Lifesaver's Gajaindaren, a professional insurance agent and member of the Million Dollar Round Table, says that while the intention behind the scorecard is good, some of the metrics do not reflect the quality of the services provided by the agents. For instance, the persistency ratio - which rewards agents if their customers pay their premiums continuously for two years - is not a good measure. "Customers may not be able to do so if they unexpectedly lose their jobs, for instance, and are short of funds to pay their premiums." Although the sales target only takes up 30% of the balanced scorecard, the internal weightage set by each insurer could affect the total score of an agent's performance. "After multiplying that with the weightage of the balanced scorecard, the final result could end up pretty heavily sales-driven," says Gajaindaren. There is a lack of communication between the top management of some insurance companies and their agents, he adds. "The CEOs of some companies do not engage with the people on the ground and it is a pretty one-sided process. In some cases, I would say there is hardly any engagement at all." As a result, agents feel they are being penalised without getting a clear explanation, he says. Gajaindaren says the scorecard aims to increase the sales target to RM80,000 from RM50,000 last year, but the plan has been delayed as agents on the ground are unhappy with the move. However, an agent who works for one of the top three insurers in the industry supports the balanced scorecard. "It is good for both the consumers and industry. From a regulatory perspective, there are not many tools that can be used to change the behaviour of industry players. It has to start somewhere," she says. "While I am not sure about the communication between top management and their agents at other companies, our CEO did talk to us about the scorecard. I appreciate the fact that the CEO personally communicated this to us." Another agent who wishes to remain anonymous says, "When more part-time agents are weeded out, who will be servicing their existing clients?" Channel conflict is a key challenge when it comes to pushing for online distribution. What would the agencies think when the top management of the insurance company they are serving tell them that digital is the way forward and some products will be sold online? "They do not want to [as the commission is low]. So, I asked. 'If you do not want it, can I sell it online? But I promise that as the customers get older and wealthier and need complex financial solutions, that is when you will come in and talk to these customers. I cannot sell complex products online - at least for now.' They said that would be fine." In fact, 27% of the company's sales brought in by new agents today come from digital leads, says Rohit. This means the company's digital strategy does not erode its agents' sales. In fact, it enhances their sales. "There are customers who fill in their information online but do not buy any products. So, we pass these leads on to the agents and that helps them to generate sales," says Rohit. The mindset and cultural change at an insurance company is another stumbling block preventing them from reacting quickly to changes in the market. Rohit shares his first-hand experience as CEO of AXA. "Imagine a CEO saying, 'I want a product to go live within three months from it being written down on a white board. That was me. In the first 10 days, nobody took me seriously. Over the next five days, people started coming into my office to tell me why three months was crazy as the fastest the company had ever done was nine months. "So, on the 16th day, I told the branding and communication team to book me a media venue. Then, I informed the team that we would be having a media launch for the product on a particular date. From then on, nobody asked me whether something was possible or not. "A change in mindset like this takes time. The banks went through this 10 or 20 years ago. The insurance industry is a risk management industry. Being risk averse is the nature of the business and it takes time." Insurance companies will continue to evolve going forward as the rest of the initiatives under Bank Negara's framework are implemented. One initiative that is expected to kick off in the middle of this year is the gradual removal of the operating cost control limits. This will be applied to management expenses, commissions and agency-related expenses. This means insurance companies will no longer have a strict cap on the commissions they give to agents and agencies as well as agency-related expenses, says Rohit. So, insurers with large capital reserves could strategically spend more money to win greater market share. "It depends on how the market takes it, really. If somebody decides to be a cowboy and throw open a war chest, the small guys will find it hard to survive. However, I do not think this will happen as there are some rules and regulations behind the initiative and the regulator, which has done a good job so far, will be keeping an eye on such events," he says.